What is it About Apologetics That We Do Not Understand? Ever hear objections like these about apologetics? These are just a few of several that I will not answer in this posting. All I will say is that when an objection is made against apologetics, the person making the objection now has the burden of proof on them to defend that position. In other words they have to “give an answer back” as to why they believe their objection is true. Now that my “health button” has been reset, I wanted to go back to the some basics and share with you a few ways to understand why apologetics is necessary in our present day. For the purposes of this posting, I am going to address the subject by defining what we mean by apologetics and then show two important practical aspects for the believer and for the church at large. I have been seeing a lot of my colleagues posting on the social media similar messages to what I am seeking to accomplish here. I really believe that it is high time for believers, in light of the culture, to understand this necessary “spiritual discipline” in light of all that is going on in the culture and in the church. Is apologetics biblical? Yes. The word for making a defense (apologia) is used eight times in the New Testament: (Acts 22:1, 25:16, 1 Cor. 9:3, 2 Cor. 10:5-6, Phil. 1:7, 2 Tim. 4:16, and 1 Pet. 3:15). But it is the last verse that is most commonly associated with Christian apologetics. ” . . . but sanctify Christ as Lord in your hearts, always being ready to make a defense to everyone who asks you to give an account for the hope that is in you, yet with gentleness and reverence,” (1 Peter 3:15). What apologetics is and is not. First off let’s deal what apologetics is not. Apologetics is NOT about apologizing for believing what we believe as Christians. This is in most cases the first thing that people think about when they hear the word apologetics. The goal of apologetics should be evangelism, thus making it the handmaiden to evangelism. It is not about introducing a dose of confusion to make the gospel sound more profound. Apologetics should point to the reasonableness of following Christ, and show that the Christian worldview is superior to all of its competitors. Apologetics is not about worldviews, or creation/evolution debates, etc. It can involve these things at times. An apologetics talk or seminar can focus on these tertiary topics, but these topics are not the end game in “doing apologetics.” I often hear homeschool parents talking about their curriculums and stating that they are teaching their kids how to answer evolution. That is all fine well and good, but that is not apologetics. Christian apologetics is that discipline of Christianity that deals with answering any and all critics who oppose or question the revelation of God in Christ and the Bible. It can include studying such subjects as Biblical manuscript transmission, philosophy, physics, biology, mathematics, evolution, and logic. But it can also consist of simply giving an answer to a question about Jesus or a Bible passage. If you are living out your Christian faith, and you find yourself working in a setting that is not predominantly Christian friendly, there are some things you need to consider about how apologetics relates to your Christian walk. If you read 1 Peter, it is important to remember that Peter was writing to a persecuted church, and not to an ivory tower full of scholars and philosophers. That being said, it is important for believers to understand that apologetics has a practical part in the Christian walk. So here are particular three settings that you may find yourself in, where you will need to engage the task of apologetics. Think of them in the following settings: the practical, the evangelistic, and the conversational settings. In the practical setting apologetics is the application of knowledge to demonstrate that Christianity is true. This setting might involve one giving a presentation of the truthfulness of the Bible or a defense of the bodily resurrection of Jesus Christ. It can be in the coffee shop where a student has asked to meet with you and you are answering their questions on why you are a Christian and not something else. Within the setting of evangelism, we need to understand that evangelism and apologetics are necessary together in today’s culture. Not every person you engage for the gospel will be willing to listen to the Four Spiritual Laws, the Roman Road or even go through a Got Life Doc. The evangelistic understanding for apologetics is that apologetics is the work of convincing people to change their skeptical views, allow themselves to open up to the gospel message, so that they might believe on Christ. Apologetics should never be about introducing a dose of confusion into the gospel in order to make it sound more profound; but to communicate the profundity of the gospel so as to remove the confusion surrounding it (the gospel), so that the person might be saved by the Spirit of God. Within the conversational setting, people at work who see your good behavior in Christ are going to one day ask you “to give a reason for the hope that you have.” (1 Peter 3:15a) Your co workers may notice that you don’t talk a certain way, participate in certain types of conversations, listen to certain kinds of jokes, or that you hold to a higher ethical standard than they might. So when the curiosity rises the conversations may begin and you may find yourself engaging in a conversation where you will be needing to give credible answers to your curious coworkers’ questions. Please feel free to email me on this and ask for any advice as I have this happening a lot with a particular co-worker.Apologetics Toward an Unbelieving World and the ChurchBefore I close this post, there is something more I need to share. There are a couple of objectives that I need to bring in here that will see the urgency of apologetics in the life of the church. Those two objectives are a positive objective and a negative (not what you think) objective. The positive objective for apologetics is directed toward an unbelieving world is when we make a positive case for the Christian faith, by defending the objective nature of truth, giving reasons for the existence of God and providing a defense of miracles, and for the credibility of the gospel records, and evidence for the deity and resurrection of Jesus Christ. It is in this sense that we are primarily concerned with apologetics toward an unbelieving, skeptical, question asking world. However there is a negative side, that is really important to the health of the believer and the church at large. 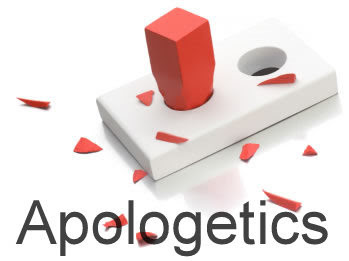 The negative objective for apologetics is directed toward the believer, and has to do with preventing believers from falling into error, and misunderstandings regarding the Christian faith. So it is here that we are speaking to, educating, and equipping believers, so that they will not fall into error. Apologetics is used to bring that education to the believers in the church, so that they will not be deceived, and so that their faith can actually be built up and some confidence can be given to them. There is a lot of deception going on in the church at large in these days, ranging not just from cults like the Mormons and the JWs. There are movements like the Word Faith Movement (positive confesssion/name it claim it), contemplative prayer (rooted in Buddhist mysticism), “holy laughter,” yoga, the New Apostolic Reformation heresy (International House of Prayer/Prayer Furnace movements), positive attraction, etc. Ultimately, our standard comes from “God’s two books”: the general revelation of God (the creation which shows His handiwork (Psalm 19:1), and the written revelation we know as the 66 books of the Old and New Testaments. If we look at 2 Corinthians 10:3-5 gives us instruction on the offensive side: “For though we do walk according to the flesh we do not war according to the flesh, for the weapons of our warfare are divinely powerful for the destruction of fortresses. We are destroying speculations and every lofty thing raised up against the knowledge of God, and we are taking every thought captive to the obedience of Christ.” We should be able to defend our reasons for believing (1 Peter 3:15). Contrary to some, we can seek out those who oppose Christianity (2 Corinthians 10:5). Of course, we should be prepared to do this beforehand, and all apologetics is to be done with gentleness and respect (1 Peter 3:15). Apologetics can also be about the work of convincing people to change their views on truth and reality. In this, it is similar to preaching because its goal is ultimately the defense and presentation of the validity and necessity of the gospel. It is an attempt to persuade the listener to change their beliefs and life to conform to Biblical truth and to come to a saving relationship in Christ. Unbelievers have good questions. Christianity has good answers. And God has told us to give them the answers they are looking for. However some of the questions that are being asked have underlying issues, so it is important to listen carefully what the person is asking. And those persons even grace our pews on Sunday mornings. Not everyone has deep philosophical questions, and God never guarantees our success. The successes that we experience are His business, and He has told us to be ready. For the person making the objection against the need for apologetics, they will have themselves defending their position, thus “making a verbal defense” or “giving an answer back” as to why they believe that apologetics is unnecessary. Here’s a fun thought though. Whenever a young person commits a trespass against another, it is only natural to make an apology to the offended person. Every so often though, I find it interesting that the one committing the offense will try to defend their actions, particularly when they think that there is no guilt involved? C.S. Lewis, The Weight of Glory and Other Addresses (MacMillan, 1980), 28. Also a final thought in a footnote. With all the fallout, churches are saying that they are seeking to reach the culture, but they are totally unaware of what the culture looks like, and smells like. Pastors are not hearing the conversations that their parishoners are having with the happy pagans of our culture and how the answers their members are giving are likened to tennis balls bouncing of the castle walls, instead of demolishing them (2 Cor. 10:3,4). Pastors today are a determining factor on how fast or how slow an apologetics program can become part of the curriculum and eventually the lifeblood of discipleship in equipping the saints. * This post appeared on my old blog as well as on the Poached Egg Apologetics Resource page. It has been updated since the initial post in order to keep the issue in the forefront. Please feel free to engage the material and interact with me on it either by leaving a comment below or by email. Previous Post: The Real Issue Podcast: Is Defending the Faith Biblical?